– a No Drive Day yay! Took me about 5 minutes to grate the soap (while coffee was brewing) and soon the laundry was rolling downstairs….happy are the days to have a washer/dryer in my home – that was not always the case – another gratitude touchpoint! Ingredients – all in paper or cardboard recyclable and biodegradable packaging -stellar! 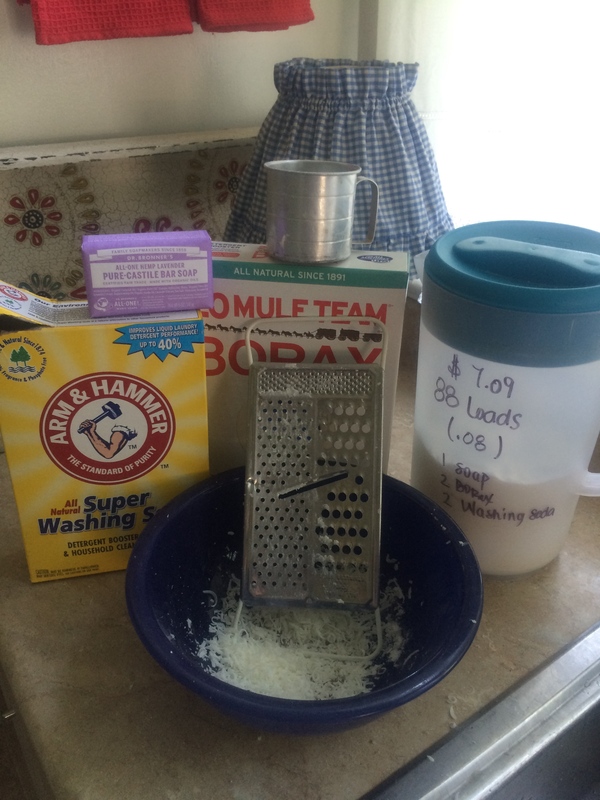 Ratio of 1 Soap to 2 Borax and 2 Washing Soda….I usually find the grated bar soap to yield 2.5 cups. Then I add 5 C each of Borax and Washing Soda…in the end the average cost per load (1/8C) is just under $.09….compared to other natural brands which can average $.20 a load this is a bargain – all you need is some advance planning and a little elbow grease to grate the soap. I do recommend Seventh Generation liquid soap if you need it – comes in a cardboard “bottle” – yay! $12.99 for 66 loads….very concentrated…good stuff but a little pricey. I also like Wegman’s Free and Clear (.$10 per load for the huge bottle) but….it is in plastic – I prefer something more biodegradable. There is very little powder laundry soap out there it seems…. …and happily, there was a pint of blubes in my frig – oh Joy! Rapture! A simple joy to have the ingredients on hand and the time to make this treat…not taken for granted! 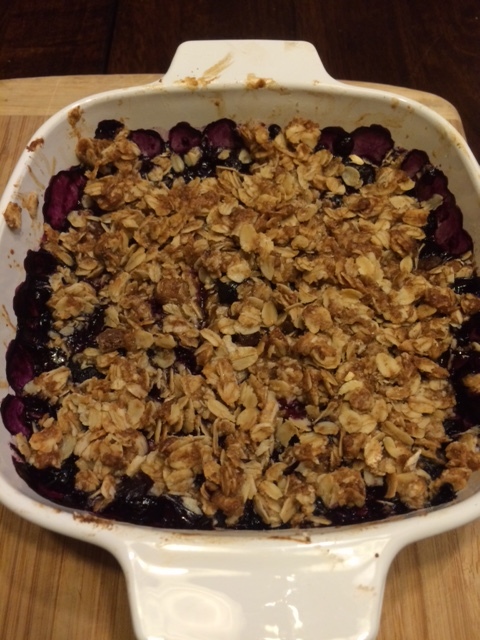 Fresh NY blueberries and real maple syrup supplemented with non-NY flour, sugar, cinnamon, oats, and coconut oil…I left out the lemon juice and cooked it for 25 minutes. It is kind of perfect. Makes one serving haha. I have “cheated” on my month of NY Only Foods and I’m not mad…forgive me? Have a Nothing new Fresh Fruit Crisp Day! DAY 2 – HOW HAVE YOU BEAN? Here is my first cranberry bean treat – I added some olive oil, salt and pepper to a scant cup of cooked beans and heated them up – mashed ’em with a fork and made a spread out of them – yum! Added a little Wegman’s Spicy Green Sriracha (not local) and topped if off with some roasted peppers I had made this past week…delicious and filling. I bought the locally made bread (Baker Street Bakery – Park Ave in the ROC) from Red Bird Market in Fairport. Life is good. 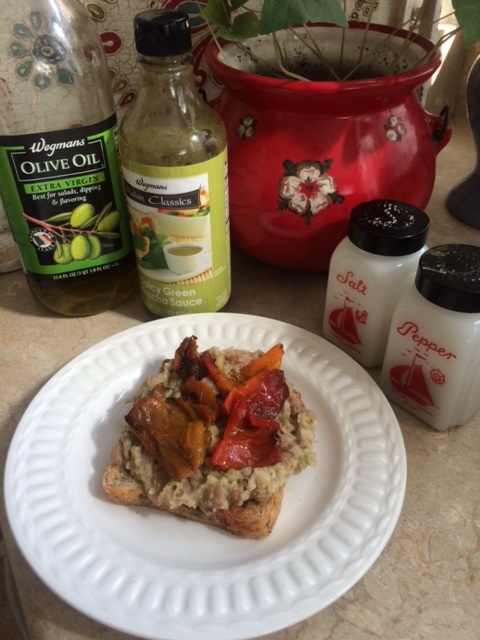 Oh, I am by the way, allowing some non-NY foods this month – grateful to have the means and access to these supplemental foods – now that I am vegan (since March 13, 2015 – Thank you Jeannett Manzanero at Palm Beach State College!) I am adding these items in to make it a little easier – other than these, I will be eating only NY fruit, veg, beans, bread, grains, & pasta/pasta sauce. AND, when I travel, I will eat natural foods grown or made within 100 miles of where I am at the time – heading to PA a few times as well as IA this month – fun! I will bring a cooler of NY provisions when possible but when needed will Farm Stand It to get what I need for eats. PS – I canned peaches today – channeled my ancestors and honored the former residents of this old house, who I am guessing canned their share of peaches in this very kitchen. Photos pending. You may find that I get funnier as the month goes on – or not. Good luck. 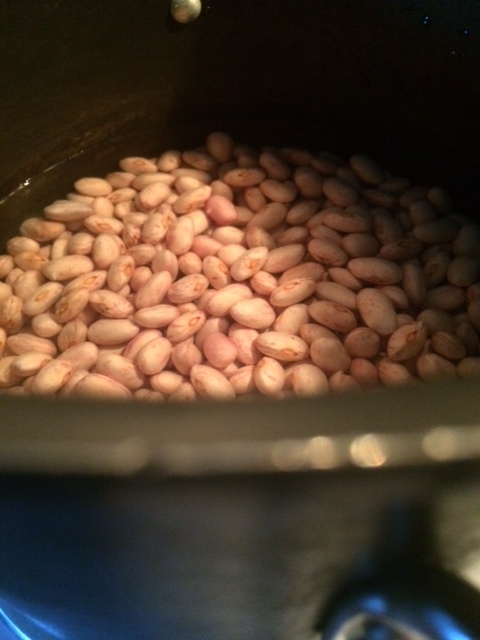 I soaked 2C of beans in 6C of water for 24 hours then cooked them on simmer for almost 2 hours….1.5 hours would have worked…yielded about 4C of beans when all fluffed up. I put some in little containers to freeze and kept some in the frig to eat in the next few days…. Oooo – I also harvested my garlic today – – film at 11. And mowed the front lawn (my wonderful neighbor Josh mowed the back – I am so grateful! ), went to the Public Market, the Fairport Market, the Used Tool store, Redbird Market, Hart’s Local Grocer with grand neighbor/friend Marcia. A true luxury day of doing errands and getting back on track with a few things including a lot of shredding and cleaning…hooray! I shall rest now – I hope you can too.